Gentoo Forums :: View topic - Log out button not working in LXDE? Log out button not working in LXDE? Posted: Mon May 09, 2016 9:35 am Post subject: Log out button not working in LXDE? at the moment the red button of log out is not working - I get an error message. I do not know if it stopped working after one system updating or I changed something. Please advise how to make the linkage between button and this command? Posted: Mon May 09, 2016 10:42 am Post subject: Re: Log out button not working in LXDE? 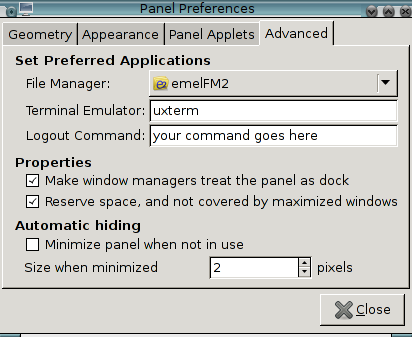 Did you customize the command in the panel preferences? Guess it somehow depends on which window manager you are using for the lx stuff. It is openbox window manager. I have only the line: 'Terminal Emulator', but the line: 'Logout Command' is missing?? Strange but here what I have under .config - no lxpanel directory? ?